Lisa Cubitt was moved to tears when she realised she had won the ULTRAMOX Lady Rider of the Year crown. She was one of six combinations who had gone clear in the opening round, with another five four-faulters joining them for the second round. In the second, clears came from Alexa Randall (Auckland) aboard LC Tango and teen Steffi Whittaker (West Melton) aboard her new stallion Eros K, but both were carrying four faults from the opener. Cubitt and Matawai Sentana were seventh to go and took out the second fence with a mighty crash but quickly regained both speed and composure to finish with just the four faults from the two rounds in a super 52.58 seconds. Tegan Fitzsimon (Canterbury) and Double J Monarch had the first of the double in what was a nice steady round to finish on four faults in 56.53 seconds. Last to go was Kimberley Bird (Ashburton) aboard Cera Cassina who gave it their best effort but had a rail, stopping the clock at 55.15 seconds. Cubitt, who last won the crown in 2015 aboard her beloved Bates Amaretto MVNZ, couldn’t believe it. “I am overwhelmed and quite emotional,” said the 32-year-old. This was just her fourth show aboard Matawai Sentana (owned by Jacqui Wright) and he had been in their “sell stable” for just six weeks. Cubitt felt the horse was “super” but had felt he was a “little way off” starring at this level – how happy she was to be wrong. The win was quite different to her last aboard Bates Amaretto with whom she had a long-time partnership. Ten-year-old Matawai Sentana had been produced by his owner Wright and been successful at pro am level. John Cottle had ridden the horse for part of the season before he had come to the Cubitts. Cubitt thanked the team she had around her, and said her groom Natalie Rowles had been key to keeping the horse relaxed. “It is a real team effort,” she said. 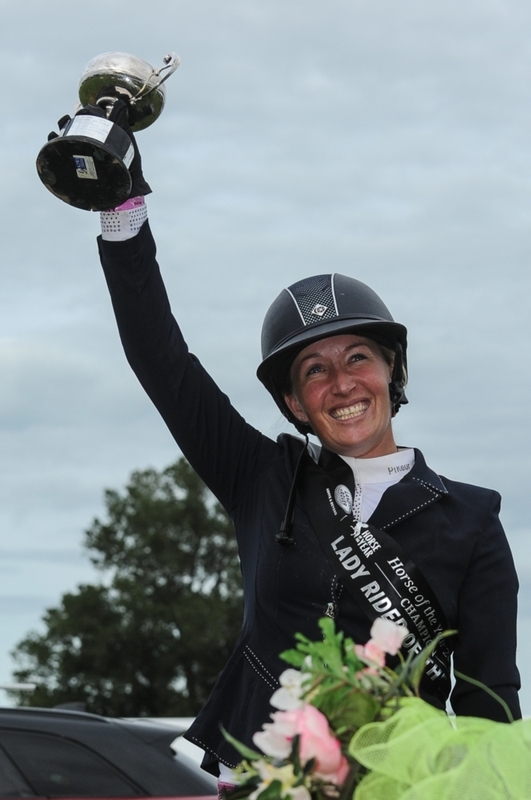 Cubitt received the Merrylegs Cup from Merran Hain, who is celebrating her birthday today and is a four-time winner of the Lady Rider. Cubitt, husband Sean and three-and-a-half-year-old son Finn had moved back to New Zealand in May after two years offshore. She first competed at HOY in 1997, when it was still held at Karaka, and only missed two shows since. 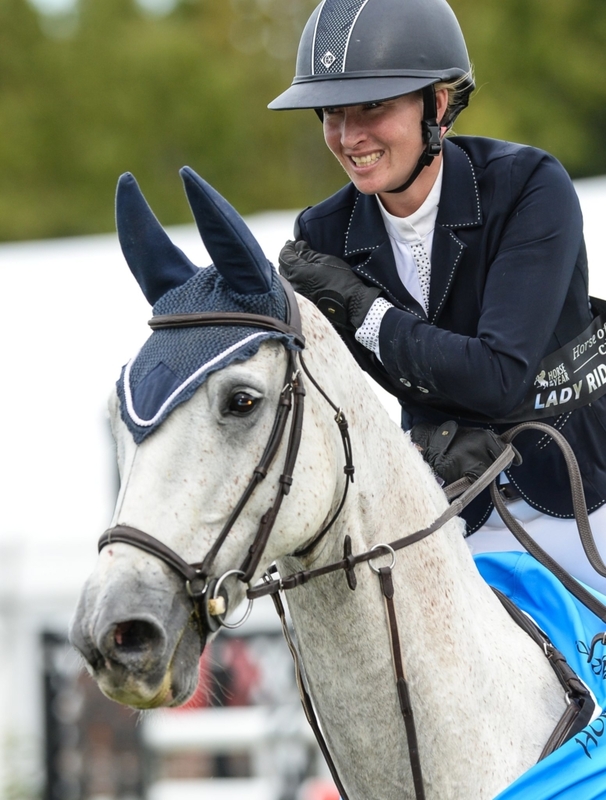 Ultra Mox Lady Rider of the Year: Lisa Cubitt (Cambridge) Matawai Sentana 1, Kimberley Bird (Ashburton) Cera Cassina 2, Tegan Fitzsimon (Canterbury) Double J Monarch 3, Emily Hayward (Te Awamutu) Belischi HM 4, Steffi Whittaker (West Melton) Eros K 5, Alexa Randall (Auckland) LC Tango 6.